I dedicate my time with patients to ensure I have listened to each individual’s history, and provide education as to the source of their symptoms, as well as all available treatment options. In many cases, I prescribe non-invasive interventions to relieve my patients’ symptoms. If surgery is advised, I provide detailed explanations as to how and when the surgery will get them back to an active lifestyle. Dr. Saatman is board certified by the American Board of Neurological Surgery and specializes in the surgical treatment of adult degenerative spine and peripheral nerve disease. After graduating as the first female resident from the University of South Florida’s neurosurgery program, Dr. Saatman provided unsurpassed patient care for 10 years at a private clinic in Brandon, Florida, where she served as president and chief neurosurgeon. 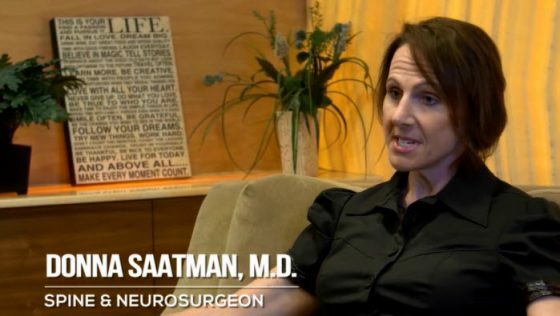 As an expert in the field of neurosurgery, Dr. Saatman has delivered numerous local and national lectures, attended clinical courses to expand her areas of expertise and participates in the American Board of Neurological Surgery Maintenance of Certification program. In addition to her daily practice, Dr. Saatman serves on several medical advisory boards and has participated in two national clinical outcomes trials. She was recently invited to participate in the HCA West Florida Division Spine Best Practice Panel. Dr. Saatman is a member of the American Association of Neurological Surgeons, Congress of Neurological Surgeons and the North American Spine Society. Dr. Saatman’s personal interests include equestrian activities, spending time with her Dobermans and gardening. Dr. Saatman and her team revisited my previous surgery. She revised my surgery by removing an anterior loose screw and added posterior rods and screws along with a fusion. It is four weeks out and I feel amazing with NO pain. The surgery sites from the front and back and the incisions look great. I very much appreciate her and her team for the help that she has given me. If you seek a professional team with compassion, I recommend her and her team. I have had numerous surgeries in the past. I had extreme pain in my lower back, hips and knees. Dr. Saatman and her team performed surgery and I had instant relief. The entire team was very polite and professional. They took their time and spoke to me in laymen terms. They made me feel very comfortable, treating me with respect and caring about my well being. Dr. Saatman and Michael Ferentino, PA-C were outstanding. I was in excruciating pain and they quickly assessed me and the surgery was scheduled. Everything went fine. I am pain free and moving without any problems. I had a cervical surgery on C5-7. I could not be happier and would recommend them wholeheartedly! Dr. Saatman performed a discectomy. I was very nervous about spine surgery and had avoided it for ten years. The procedure was nothing like I imagined. After the procedure on 5/15/18, I only had to take three pain pills. One each night. I am now walking 3-4 miles a day. I have zero sciatic pain. I cannot believe I waited this long. I flew to California on the first of July, a five hour trip, and experienced no pain. I cannot express how thrilled I am to be pain free. I am finishing my recovery time and resumed a healthy, pain-free life style. I am able to go back to teaching, golfing and working in my yard. Living my life. Thank you very much. God bless you. Dr. Saatman performed my back surgery on 5/2/18. I am very pleased with the result. She was very compassionate and her Physician’s Assistant, Michael Ferentino, was awesome during the pre-op and post-op visits. Her Administrative Assistant, Tasha, was very helpful in setting up surgery and answering any questions that I had. I would definitely recommend Florida Orthopaedic Institute. Dr. Saatman was very informative and straight forward. She took 45 minutes with me on the first visit. I had a herniated C6-7 disc that did not respond to shots or therapy. I ultimately had a Mobi C neck disc replacement. I woke up with instant relief and the numbness in my arm was gone. Best thing I have ever done and I’m so happy with my outcome. The staff including Nicole and M. Ferentino, PA were amazing to work with. I have recommended Florida Orthopaedic Institute to so many people. I have always been very impressed with their professionalism, ease of scheduling appointments, responsiveness of the physicians, cleanliness of the facilities and responsiveness of the physician’s administrative assistant. I will continue to recommend them! Thank you Dr. Saatman for being my surgeon. You will always hold a special place in my heart. I am very grateful to have you as my doctor, you are so talented. When I went to Florida Orthopaedic Institute, it was my second attempt at finding a doctor or surgeon that I trusted and believed that they would be able to improve my quality of life. In 1998, I fell off a thirty-two foot cliff while on patrol sustaining several injuries and I also suffered additional injuries from two explosions in Iraq, in 2003 and 2004 . I could no longer play cards with my family or do pretty much anything without severe pain in my back. I met Dr. Saatman, she and her PA were very professional and honest. She explained the recommended procedure and was very patient in explaining it to me. The surgery, while I was nervous, went great and Dr. Saatman made me feel secure. The surgery was a COMPLETE SUCCESS. I cannot believe the results that I have had, amazing! The recovery was very quick and the pain was not bad at all. The scar is minimal and getting smaller. I cannot say enough good things about this team and the care that I received! I wish she and her PA were general physicians, I would request to be seen by them on a regular basis! Great caring, professional, polite doctors! THANK YOU! My husband and I have been patients of Florida Orthopaedic Institute for many years. Upon a follow up visit, we noticed that a “Dr. Donna Saatman” was on one of the sign up sheets! Could this be the same Dr. Saatman that did spinal surgery on my husband in 2011? We had to inquire and yes, it was Dr. Donna Saatman! We were so happy to see that she joined this great group of doctors!Upon examination and MRI, Dr. Saatman determined that my husband did not need surgery at that time and recommended pain management. After returning a year later, she scheduled him for surgery. I believe Dr. Saatman has “hands of gold”! She operated on my husband’s back for 9 hours. His surgery was complicated, due to scar tissue, from his previous surgery. My husband has been walking around with no pain, ever since! When I experienced extreme sciatica pain due to a herniated disc, I wouldn’t have anyone else operate on me other than Dr. Donna Saatman! My surgery was on 3/27/17. It was Outpatient Surgery but I can honestly say that I don’t have any more back or leg pain and I am recuperating nicely. So whether you have to have major or minor back surgery, we highly recommend Dr. Donna Saatman! We give her 5 GOLD STARS! On December 7th I had kyphoplasty surgery at Brandon Hospital. Dr. Donna Saatman with Dr. Michael Ferentino performed the procedure. I could not have asked for the surgery to have gone any better. The doctors were both so reassuring and showed so much gentle kindness to me. My pre operation appointments went well and at 90 years of age I was quite apprehensive, but all during the time I felt a caring spirit of concern for me. I am grateful for Florida Orthopaedic Institute’s commitment and dedication to their patients and kudos to Dr. Saatman and Michael Ferentino. Dr. Saatman is just a wonderful doctor. She works with you to get back on track after surgery and she listens to what you say. I refuse to have anyone else take care of me for back or neck problems. I have to give a shoutout to Dr. Donna Saatman at the Florida Orthopaedic Institute! She’s very caring, kind, thorough and has a great bedside manner. She preformed Balloon Kyphoplasty on my mom’s back today. We came in with the expectation of having this procedure done to only two vertebrae. During the surgery Dr. Saatman looked at each vertebrae individually to see if there were any other fractures that have occurred since the initial MRI. She found two more and repaired them at the same time. My mom keeps saying that she cannot believe her upper back isn’t hurting. If you are having back issues, I’d highly recommend seeing Dr. Saatman! I would like to say thank you from the bottom of my heart to Dr. Saatman and her team, Michael and Nicole for making the most terrifying experience in my life a great one. I have never had a medical concern in my life and when I herniated my L5/S1 and was at a level 10 pain I thought life was over. I am an overly analytic person and have to ask a ton of questions to know all possible outcomes to make a decision. I am most certain that I drive Dr. Saatman and everyone else beyond crazy asking endless questions (I come in with printed lists) but they never make me feel bad or try to rush me out of the office before I am comfortable. Dr. Saatman is a brilliant surgery with amazing hands. She commands your presence when entering the room and knows exactly how to frame questions so she is able to get the proper responses from you to diagnosis and treat you. She performed a lumbar micro-discectomy on my L5/S1 in February of 2016 . They were wonderful in prepping me at the hospital and the recovery has been terrific. I am so grateful to see a light at the end of the proverbial tunnel and can’t wait to dive back in to the life I love. This is the best medical team I have ever dealt with in my life for myself or others and could not imagine being treated by anyone else. My experience with Dr. Saatman started 5 years ago thus January. I had a tragic fall at a department store. I knew I was hurt when I fell because I went numb from the waist up for a while. I contacted my Dr.at that time. He blew me off and tried to tell me I was fine. I knew different. My current Dr. was able to get me in with Dr.Saatman which at that time had her own practice. After doing the necessary tests Dr. Saatman performed quite lengthy surgery on both the front if my neck and back of my neck. I will always be gratefull to her she gave me my life back. She also did surgery on me on May the 8th this year since being a Dr. at Florida Orthopedic. Dr. Saatman is a wonderful Dr. you are very blessed to have her on your team. I hope she is with you for years to come.